Workplace injuries and illnesses in the US alone cost over $190M annually. Therefore, any solution that can improve employee safety and mitigate risks in the workplace is invaluable to both employers, and the insurance companies that insure them. In Haifa Research Lab, we are working on a novel risk mitigation platform that is designed to improve employee safety. This solution is based on data provided by wearable devices and IoT sensors coupled with advanced analytics, which we call ‘shields’. Each shield comprises analytics for the detection or prevention of a specific work-related hazard. Examples of such hazards include falls, heat stress incidents, gas exposure, and overexertion. The solution allows the specification and dynamic assignment of shields to the various employees per their various roles, allowing managers to retain ongoing safety awareness, prevention, and trigger first response in case of emergency. The solution is being developed throughout a series of client pilot engagements in actual environments. (1) A Common platform consists of the technological infrastructure to to connect, collect, store and analyze IoT data. · Learning of behavioral patterns and anomalies that might lead to safety incidents and potential risks. · Stream analytics to identify hazard patterns in real-time. · A library of “shields”, business logic to protect employees from hazards. (3) Front-end Apps (Mobile/Dashboard) –this includes both mobile based applications for end Workers to integrated with body-worn and IoT sensors and to be alerted upon hazard recognition. A Safety Management and Dashboard application for supervisors to check in real-time team’s safety status. We will describe few other pilots from variety of industries such as Energy and utilities, Oil and Gas, and Logistics. • How wearable data coupled with advanced analytics can be used to significantly improve occupational Health and Safety. • The type of Employee safety use cases that wearable technology can be applied to. 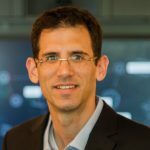 Nir Mashkif is a Manager and Research Staff Member at Haifa Research Lab, leading the Wearable and Iot Solutions group. His expertise’s are IoT, Wearable Technologies, Mobile, Cloud, Software Architecture, Systems Engineering, data integration, Multi Objective decisions, and Optimization. Previously Nir led several research projects in the areas of IoT, Wearables, Systems Engineering, data and systems integration, and optimization. Before joining IBM, he worked for more then 10 years mostly in the Telco and IT industries, leading the development of large scale back-end systems. Nir holds a B.Sc. in Information Systems and a MBA from the Technion – Israel Institute of Technology.